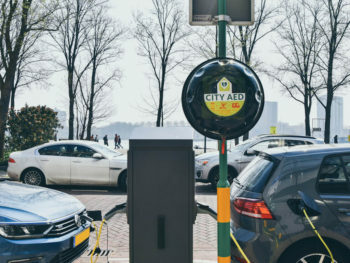 Five more electric vehicle charging stations with automated external defibrillators (AEDs) have been installed in the Netherlands. The public chargers from EVBox have been installed in Rotterdam following a successful pilot last year in the city of Delft, led by the City AED organisation. The initiative helps improve national AED coverage and allow first-aid helpers easier and quicker access to AEDS, many of which are currently still located inside buildings, limiting access especially outside of business hours. The AED itself runs on an internal battery, which is not connected to the charging station and always keeps functioning independently (also during for example a power outage). “Combining our public charging stations with an AED is a smart idea, one with life-saving potential. We like participating in these kinds of ‘creative’ collaborations as they contribute to our long-term goal of creating a better, greener, and healthier world,” said Kristof Vereenooghe, CEO EVBox.